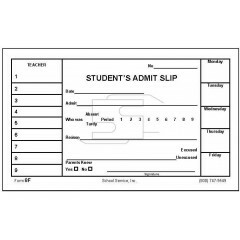 These school forms are available in padded form, book form, & carbonless form. 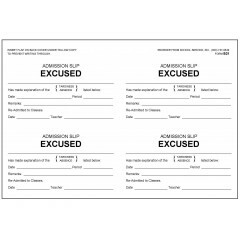 School Service's excuse forms include excuse for absence, excuse for tardiness, excuse for clinic & excuse from gym. 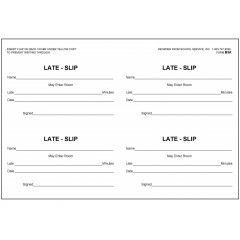 Our tardy forms include late slip, tardy slip & tardy admit slip. 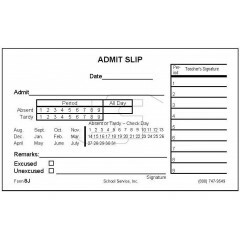 We also supply admission forms, such as, excused & unexcused admission slip, tardy admit slip & attendance reports. 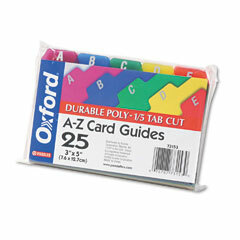 - A-Z file guides. 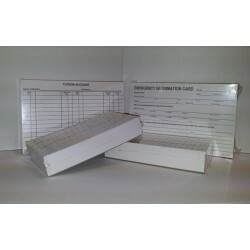 - For 4 x 6 size card files. - Polypropylene. 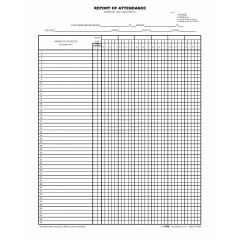 ..
Padded report of attendance. 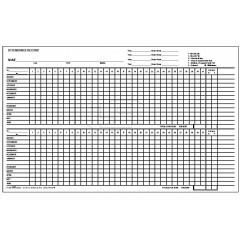 Size: 8-1/2 x 11 size Type: 20 lb bond Stock Paper .. 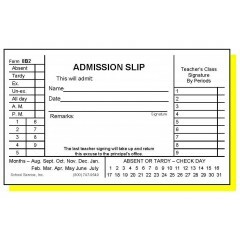 Attendance record card. 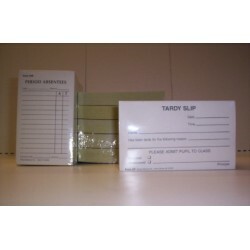 Size: 4 x 6 size Type: Index card stock Stock Paper Color: White .. 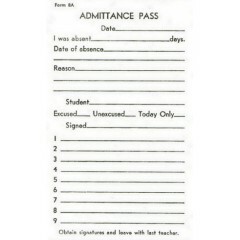 Attendance record card. 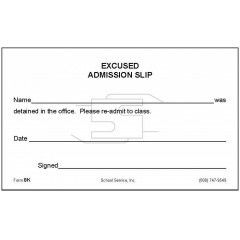 Size: 5 x 8 size Type: Index card stock Double-sided: Same inf..
Padded report of misconduct. 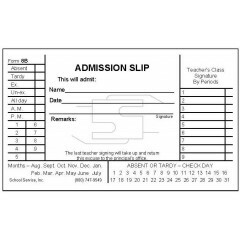 Size: 3 x 5 size Type: Bond paper padded (note pad paper) Stoc..
Padded admission slip. 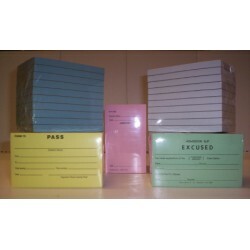 Size: 3 x 5 size Type: Bond paper padded (note pad paper) Stock ..
Discount Save $1.00, Limited time offer, order TODAY! Padded admittance pass. 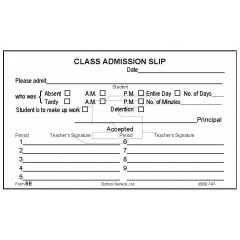 Size: 3 x 5..
Two Part Admission Slip Size: 3 x 5 size Type: Carbonless (NCR) paper Paper Color Sequ..
Padded class admission slip. 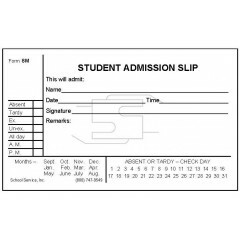 Size: 3 x 5 size Type: Bond paper padded (note pad paper) Stoc..
Padded student's admit slip. 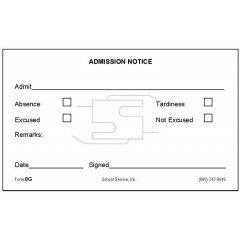 Size: 3 x 5 size Type: Bond paper padded (note pad pape..
Padded admission notice. 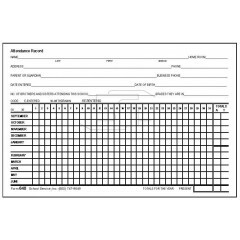 Size: 3 x 5 size Type: Bond paper padded (note pad paper) Sto..
Padded admit slip. Replaced by 8J. (Includes all months.) 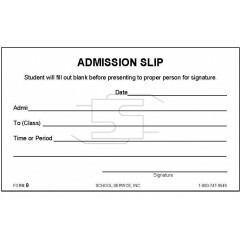 Size: 3 x 5 size Type: Bond paper..
Padded admit slip. Includes all months: Aug. - Jul. 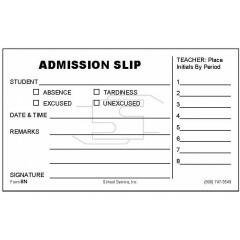 Replaces forms 8H & 269C Size: 3 x ..
Padded excused admission slip. 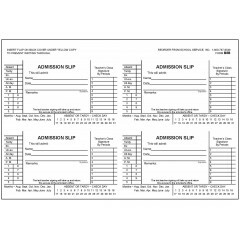 Size: 3 x 5 size Type: Bond paper padded (note pad paper) ..
Padded student admission slip. 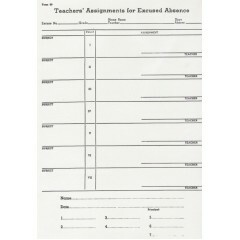 Size: 3 x 5 size Type: Bond paper padded (note pad pa..
Discount Save 50%, Limited time offer, order TODAY! 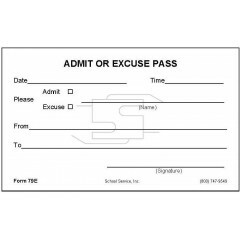 Padded teacher's assignments for excused abse..